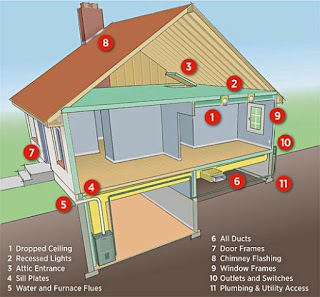 · Test your home for air tightness. On a windy day, carefully hold a lit incense stick or a smoke pen next to your windows, doors, electrical boxes, plumbing fixtures, electrical outlets, ceiling fixtures, attic hatches, and other places where air may leak. If the smoke stream travels horizontally, you have located an air leak that may need caulking, sealing, or weatherstripping. · Caulk and weatherstrip doors and windows that leak air. · Caulk and seal air leaks where plumbing, ducting, or electrical wiring comes through walls, floors, ceilings, and soffits over cabinets. · Install foam gaskets behind outlet and switch plates on walls. · Inspect dirty spots in your insulation for air leaks and mold. Seal leaks with low-expansion spray foam made for this purpose and install house flashing if needed. · Look for dirty spots on your ceiling paint and carpet, which may indicate air leaks at interior wall/ceiling joints and wall/floor joists, and caulk them. · Cover single-pane windows with storm windows or replace them with more efficient double-pane low- emissivity windows. See the Windows section for more information. · Use foam sealant on larger gaps around windows, baseboards, and other places where air may leak out. · Cover your kitchen exhaust fan to stop air leaks when not in use. · Check your dryer vent to be sure it is not blocked. This will save energy and may prevent a fire. · Replace door bottoms and thresholds with ones that have pliable sealing gaskets. · Keep the fireplace flue damper tightly closed when not in use. · Seal air leaks around fireplace chimneys, furnaces, and gas-fired water heater vents with fire-resistant materials such as sheet metal or sheetrock and furnace cement caulk. Fireplace flues are made from metal, and over time repeated heating and cooling can cause the metal to warp or break, creating a channel for air loss. To seal your flue when not in use, consider an inflatable chimney balloon. Inflatable chimney balloons fit beneath your fireplace flue when not in use, are made from durable plastic, and can be removed easily and reused hundreds of times. If you forget to remove the balloon before making a fire, the balloon will automatically deflate within seconds of coming into contact with heat. This information is provided by Energy.gov.